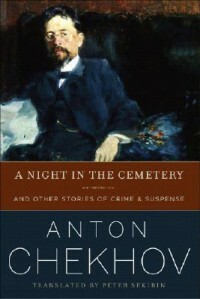 I've never read Anton Chekhov. I can't read Russian, alas, so I only know him through the lenses of his translators. Unfortunately, the lens of Peter Sekirin is not very good IMO. I get the impression that he's translating nearly word for word and literally, which means that something that's probably perfectly clear and appropriate in Russian is clumsy and nonsensical in English. Sekirin also doesn't have an ear for rendering the Russian into elegant English; it's serviceable but not great. The subtitle of this collection is And Other Stories of Crime & Suspense but anyone picking up this book expecting the mystery genre will be sorely disappointed. Yes, murder and thefts occur - quite often, in fact - but Chekhov couldn't care less about them except as they expose the motivations and lives of his characters. Only "Swedish Match" and the last three stories in the collection would I classify as being anywhere close to a traditional crime or suspense story. In spite of all that, we're still talking Chekhov, and poorly translated Chekhov is still better than a lot of first-language authors out there. There are some gems in here, though only two that I recognized from previous collections - "Thieves," which I first read under the title "The Robbers," and "Evildoer," aka "The Malefactor." "A Thief" - A tale about an exile whose wife unexpectedly arrives at the Siberian village he's living in but with a twist. "Evildoer" - A story about the intersection of village life and needs with the modern world. "75 Grand" - Another ironic tale about a man, his wife, his mistress and a lottery ticket. "The Wallet" - Three actors find a wallet and enact the requisite tragedy to the edification of the reader. "Assignment" - An amusing tale about the fulfillment of any famous author's wish when he's trapped by the talentless but clueless writer into listening to that one's work. "Dreams" - Another look at the hopes (often futile) of the Russian peasant. "Thieves" - Not sure how to describe this one. When I first read it as "The Robbers," the final scene of the burning inn and the reaction of the protagonist stayed with me. It's one of Chekhov's bleakest visions IMO. "Murder" - This is another particularly bleak vision about a murderer finding his faith again but unable to act upon it. "The Drama at the Hunt" - I don't know whether it's the translator's fault or the Russian is equally obscure but this is an attempt to explore the possibilities of the "unreliable narrator." At the end, the translator loses control of the narrative and it gets hopelessly confusing.